At Sappi Europe, not only do we still want to dream, we want to make our dreams come true. We will continue to consolidate and reinforce our position as one of the world’s leading producer of coated fine paper. To make our dreams come true, we need the right people to share our key employment values: integrity and trust, freedom with responsibility, courage to explore new avenues and personal development. 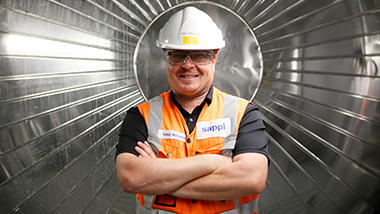 Does Sappi Europe have the career for you? When you join Sappi, you will become part of a dynamic company that strives to be the best in whatever we do. We aim to create an entrepreneurial coaching-based culture to encourage learning and growth and to enable our people to realise their dreams. If you are a student or a recent graduate, take a look at our summer jobs, internship positions and management trainee programme. Learn more about careers in Sappi North America. Learn more about careers in Sappi South Africa.